Many years ago I heard a lecture by Ken Mitsuhata, a social worker, which has stayed with me over the years. The topic had to do with Japanese American values. The two key values Ken presented are harmony and the use of indirect speech and behavior. The two characteristics are linked: Because we value harmony, we are careful with our speech and behavior not to do anything that will be disruptive or bring about any hurt feelings. This results in indirect behavior. I was reminded of this in a conversation I had with a friend of mine who is on a JA community board that has been in serious discussion with another organization on how large amounts of money should be distributed between them. She told me how difficult it is to read the subtleties in the language being used. Two organizations have this money at its disposal. How do we distribute the money fairly so as to look after the best interests of our organization, but at the same time not wanting to seem too greedy? There is a definite need evident to maintain harmony, causing the language to be cautious and indirect. Then I thought about our history during the war. We were uprooted from our homes by our government because of “military necessity.” We all knew this was wrong but we followed the advice of our leadership to cooperate en masse to “prove our loyalty.” Later thousands of us fought for the U.S. to do the same. This sort of behavior was characteristically indirect, created harmony within the community, and was successful in proving we were loyal Americans. Then, there were those who took different, more direct approaches to injustice. Misuye Endo, in 1943, filed a writ of habeas corpus demanding answers to why we were being held prisoner without due process. Min Yasui went to prison resisting a curfew order. 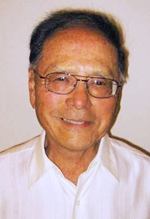 Gordon Hirabayashi defied the curfew and internment, resulting in his arrest and imprisonment. A few hundred men refused to fight for this country unless they and their families were granted the liberty guaranteed to them by the Constitution. Fred Korematsu refused to go to camp and wound up fighting the government for many years before being vindicated. Our country has always, in hindsight, made heroes of those troublemakers who resisted what they saw was tyranny or some other form of injustice. Thank God for them, or we would not have broken away from England and become a country. More recently, Presidents Clinton and Obama have awarded Medals of Freedom to Korematsu and Hirabayashi, respectively, and President Bush in 2009 included as part of the WWII Valor in the Pacific Historical Monument his recognition of the dissenters in Tule Lake. So, we as a community need to embrace Fred Korematsu, recognizing his courage and determination and holding him up for our children and grandchildren as someone to emulate. At the same time, though, we can be aware of the contrary cultural reasons we may have for our reservations. Phil Shigekuni can be contacted at [email protected] The opinions expressed are not necessarily those of The Rafu Shimpo.